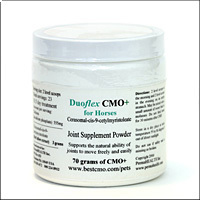 Duoflex CMO+ (cerasomal-cis-9-cetyl myristoleate) is a natural joint supplement. It is a nutritional supplement in capsule form. It is first and foremost NOT a drug. Duoflex CMO+ is a natural healer derived from the natural bovine tallow of US-inspected cattle. There are no toxic residues, no antibiotics, no bacteria, no steroids, no hormones of any kind in our products. Successful results have been consistent for 20 years (1985 – 2015). Rest assured that there are no harmful side effects. 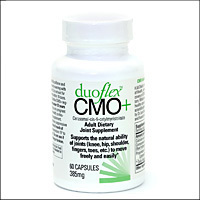 The Duoflex CMO+ formula was created to protect the joints and relieve joint discomfort and inflammation. CMO+ works by addressing the root cause of the health challenge rather than covering up the symptoms. HPR, a homeopathic arthritis pain reliever, helps many who cannot or choose not to use NSAIDS (non-steroidal anti-inflammatory drugs) to relive their pain. This companion product helps them get relief before the full benefits of CMO+ are realized. A CMO+ clinical trial plus 20 plus years of positive feedback lets us know that this product combination is a winner. Getting back in premier condition using this non-drug combo for a short period of time is NOT expensive – and does NOT require a doctor. Duoflex CMO+HPR almost always provides 100% relief of pain, swelling and return of joint mobility.It takes your personal research, product understanding and trust in a company that only wants you to be able to do more and feel better. A company that promises to refund your money if you are not 100% satisfied. PermaHEALTH, Inc has a long standing A+ Better Business Bureau (BBB) rating giving you confidence in the company who formulated and sells Duoflex CMO+HPR . Duoflex CMO+ is produced and marketed under the provisions of the Dietary Supplement Health and Education Act of 1994 and FDA supplement regulations and comes under the supervision of the Food and Drug Administration. 1 Jar of CMO Horse Powder - 70 gm.